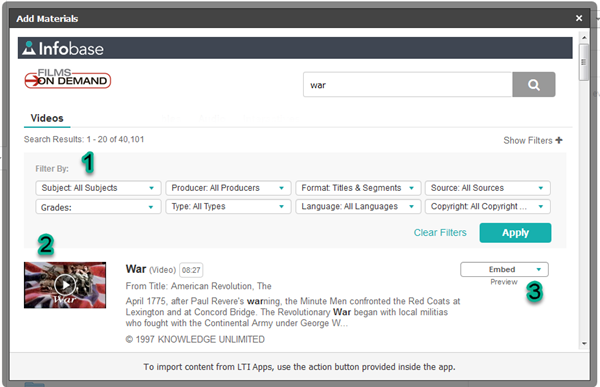 Customers using the Schoology learning management system can embed content from Films On Demand directly into their courses. For installation instructions, please refer to the Films On Demand Schoology LTI App Installation article. The LTI app provides a rich integration between Films On Demand and your Schoology courses. Users of Schoology can embed Films On Demand resources directly inside their courses, without having to leave the LMS. This plugin is LTI based and integrates directly into the standard Schoology HTML editor and the Add Materials menu within a course. LTI based application that does not require any user account maintenance within Films On Demand. Quick and easy setup and installation. A seamless user experience that allows users to embed Films On Demand video, audio, and your own custom content resources directly into Schoology, without leaving the LMS. A few examples are detailed below. 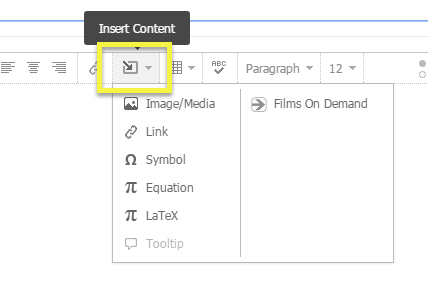 From within a course, you have the option of finding and embedding media directly into the course's materials section using the Add Materials drop-down. Click on the Add Materials button below the course name. Click on the Films On Demand App shown on the right-hand side of this menu. Once you click on this, the Add Materials pop-up window will display. Enter your desired keyword or phrase into the search box and click the search icon. The search results page offers several functions explained below. Thumbnail Image: Titles & Segments, Titles only, or Segments only. Name: Title or Segment name. Run Time: the length of the Title or Segment. Description: Text description of the Title or Segment. Copyright and Producer: for the Title or Segment. Embed Options: Record URL, Small, Medium, Large. Preview: Displays the video in a player for preview. Once you have chosen a media file to embed, click on the Embed button. You will be returned to your course materials list and now have an embedded video. Click on the thumbnail image or play button to view the embedded video directly on this page. Clicking on the media title will open it as well, but without any other materials, you have listed. The Schoology HTML editor contains an Insert Content option shown below. This icon is available inside the HTML editor used in some of the Add Materials options, such as adding an Assignment, Test/Quiz, Discussion, or Page to your course. Click on the desired option such as Add Page. Click on the Insert Content editor option. Click on the Films On Demand option located on the right-hand side of the Insert Content menu. The Import from Resources pop-up window will appear, which is identical to the Add Materials window shown above. Follow the same steps outlined above to located and embed your desired content. The content will appear as a yellow box within the editor until you click the Create button. Your new course material will now appear under the main materials list. Clicking on the title will load the resource and any embedded media from Films On Demand directly on the page.